Un•daunt•ed (adj.) courageous, fearless, bold, resolute, unflinching, undismayed, purposeful, determined to succeed. Don’t let the outside world determine your destiny. Take control now with proven success strategies to become richer, smarter, healthier and happier in spite of it all. Here is a fresh, bold guide for your ultimate quest – to bravely and freely live your best life on your own terms starting right now. 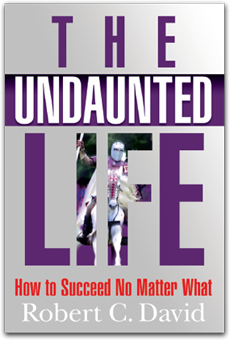 “So many books have been written on the subject of building a successful life, perseverance and determination, but none tell the story like Bob David in ‘The Undaunted Life.’ Mr. David points out the important, teaches us to let go of the unimportant and tells touching stories of his own journey along the way. The best part of this book is that it is fun to read. Because of Mr. David’s ability to talk to the reader in an intimate way, the information is easily absorbed, understood and put to use in everyday life. You don’t need to be in the financial industry as Mr. David was to enjoy the book, or learn from it. The tips are more than tips, they’re steps to help anyone to create habits that will lead to success in any area of one’s life to which they are applied. Imagine my surprise when during the following morning’s meeting our CEO introduced Bob and recommended we all read An Undaunted Life. Copies were passed out to all members of the firm. Facing my own professional and personal challenges, the next night I reluctantly opened the cover and began my journey. Although Bob’s professional background is in investment sales, this book speaks to a deeper truth than simply getting more referrals and maximizing sales. This is a great touchstone for those seeking personal, spirtual as well as professional growth. Undaunted (adj.) not disouraged, unshrinking, valiant, stalwart, unfliching, stouthearted, heroic, brave, indomitable, fearless, blod, purposeful, determined to succeed. Please take a moment and read that definition again… Let your mind, body and soul bask in the radiance of its powerful glow. How are you feeling now? Inspired, reassured? If you will but sound the welcome trumpets and lower the drawbridge to your castle, you will see a regal white horse riding in gallantly to be by your side – helping you to fight and win your life’s many battles. This silent partner delivers a potent message sure to fortify your defenses and help you unleash your inner hero when you need it most – to succeed no matter what! © 2010 – 2019 Bob David Live, Inc. All rights reserved.